Simply scattering a few barbeques on a terrace will hardly appeal to those looking for a high standard of amenities attached to a high-rise living. This writer was recently shown the barbeques on one roof top terrace, with the ground completely covered in faux turf. While the views of Melbourne’s skyline were certainly impressive, the ‘gloss’ faded by the sight of barbeques that hadn’t been cleaned. While some developers are keen to ‘squeeze’ every square metre into spaces that provide an immediate return in a financial sense, other such as MAB, see the benefit of providing a much higher standard of communal amenities in its projects. The award-winning The Quays apartments, located at Docklands, by McBride Charles Ryan (MCR), is one case in point. The Quays apartments, for example, feature a generous rooftop garden on level seven. While this rooftop garden did not form part of the initial briefing with MAB, it was decided early in the process to include this space for the 617 apartments. “The Quays is comparable to a small town. It made sense to include a private rooftop garden,” says Debbie Ryan, Principal of MCR. The Quay’s rooftop garden includes lush planting embedded with built-in seating, barbeque facilities and a rare offering, a tennis court. MAB also agreed to one of the being used like a communal cabana to allow food preparation for outdoor entertaining. And for those finishing a game of tennis, there’s also the use of the shower in this unit. 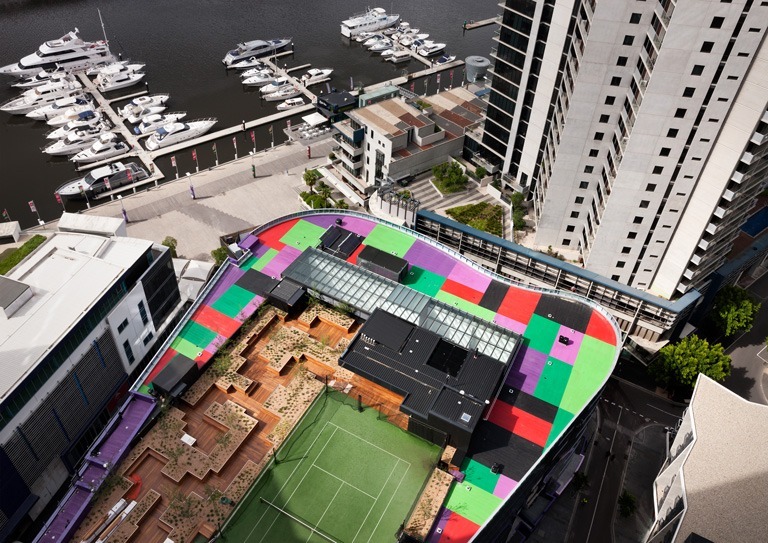 MCR worked closely with landscape architects Taylor Cullity Lethlean on this rooftop garden and included many plants with the same hues, such as purple, as expressed in the purple glass of the facades of the towers. Also in the mix is the use of sustainable timber such as spotted gum, for planter boxes. One of the most dramatic features of this rooftop garden is the vibrant paving in a patchwork of colours from pinks and greens to purple and orange. While those flying overhead in a plane will appreciate the rich patchwork quilt, so do residents and visitors staying at the hotel within this development. This verdant rooftop garden is seen as important in MCR’s design as the many communal facilities provided indoors: including a swimming pool, a gymnasium, a library, a cinema room, together with dining and lounge areas. MAB’s Banksia apartments nearby, also designed by MCR, also feature a rooftop garden, with a plunge pool and an infinity pond. “MAB are particularly generous developers. They don’t build on every square metre. It’s a deliberate move to create outdoor spaces that are pleasurable to use. Having the right outdoor space simply lifts one’s spirits,” says Ryan. Grant Amon Architects working closely with developers Neometro, was also conscious of including amenities that would be used by residents. Although a relatively modest development in comparison to MCR’s The Quays, the Smith Street project in Fitzroy (on Smith Street) goes beyond ‘ticking boxes’. Located on top of an early 20th century warehouse-style building, the tenants include a mix of residential and commercial. Amon added a lightweight three-level structure on the top of this building to accommodate 18 apartments, many with their own balconies. However, there’s also a rooftop terrace for residents to meet as well as clotheslines for communal use. Breathe Architects’ Nightingale apartments in Brunswick is credited for elevating the communal laundry several notches by placing this on the roof. “People are wanting more from living in an apartment that just a small balcony. Having a rooftop terrace, particularly one that includes clothes lines, bring residents together,” says architect Grant Amon. Unlike most development that includes basement car parking, at the Smith Street apartments, this has been substituted for generous storage for bicycles. “The tram is literally at the door so many buying into this development weren’t looking for off street car parking,” adds Amon. Those thinking that a few barbeques dotted around a terrace will appeal to buyers may be surprised that buyers are looking for slightly more than a few basic amenities. Gymnasiums, swimming pools, and particularly rooftop style gardens are now popular particularly given individual balconies may extend only over a few metres. “People want to be able to entertain family and friends, irrespective of whether they’re living in an apartment or not,” says Ryan.